Ruffian Paper Doll is the latest historical costume paper sculpture by acclaimed artist Eloise Corr Danch. Paper Doll was exhibited in October at the Museum of Arts and Design in New York for the Paper Ball, the gala opening of the paper exhibition SLASH! Paper Under the Knife. 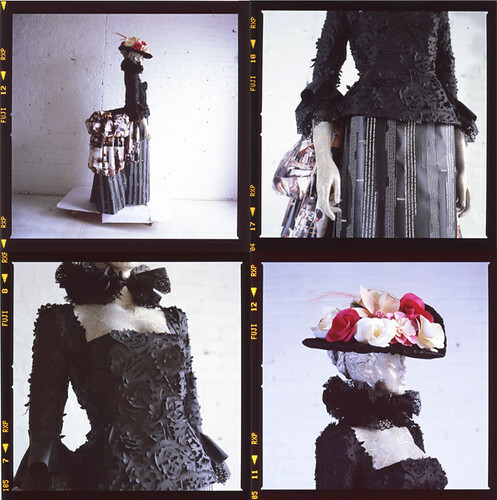 The Victorian era–inspired dress features pages of the book Ruffian: Inside Out (Assouline) and Le Monde newspapers were used to papier mache the body. For the bodice, Eloise cut an intricate pattern and devised an internal wire bustle to create the bottom shape of the dress, giving it a dramatic 1870s silhouette. Eloise’s paper sculpture work was exhibited at the Macy’s 2009 Flower Show. That installation featured swirling floral garlands composed of more than 2,500 paper flowers as well as ornate floral headdresses, all filling 23 windows along 34th Street. As a result, Eloise was invited to appear onThe Martha Stewart Show to make paper poppies with Martha. Eloise’s interest in historical costume was on view in 2008 when she exhibited Lady Dulcinea, a life-sized paper dress sculpture at the gallery in Anthropologie’s flagship Rockefeller Center store.